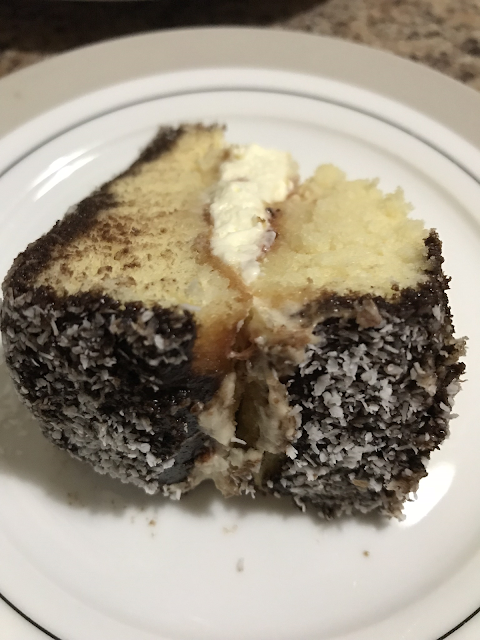 I found this wonderful Gluten Free Lamington Sponge Cake recipe in a magazine called Food to Love. 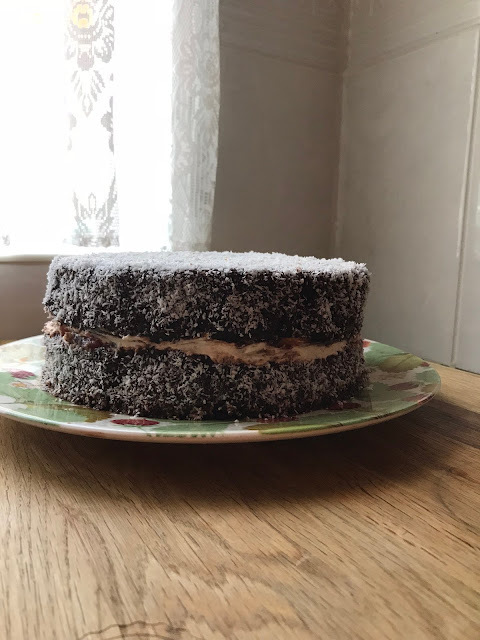 I thought it was perfect to make on Australia Day because it is my brother in laws birthday. Quite fitting for both occasions. The original recipe wasn't gluten free but thought there is a combination of flours so it should work well with gluten free flours and from the photos you can see it worked out beautifully. I am lactose intolerant but they don't make a cream you can whip that is lactose free so had to use Bulla Whipping Cream which is an excellent product as it whips up fast. Feel free to change to any alternative. (I would love to know what you choose so please share). Preheat oven to 180°C (160°C fan-forced). Grease and line two x 22cm round cake pans with baking paper. Sift cornflour, gluten free plain and gluten free self-raising flour together three times. Combine the melted butter and boiling water in a small cup. Beat the eggs and sugar in a LARGE bowl with an electric mixer on high speed for 8 minutes or until thick and creamy. Using a large whisk, gradually fold half the sifted flours, then the butter mixture into the egg mixture, then the remaining flour mixture. Divide sponge mixture evenly between prepared pans. Bake for about 20 minutes or until golden brown. Take out of pans and allow to cool. Beat the cream in a small bowl with an electric mixer until firm peaks form. Bulla whipping cream is made to be whipped and does so in 90 seconds. Nice and fast. 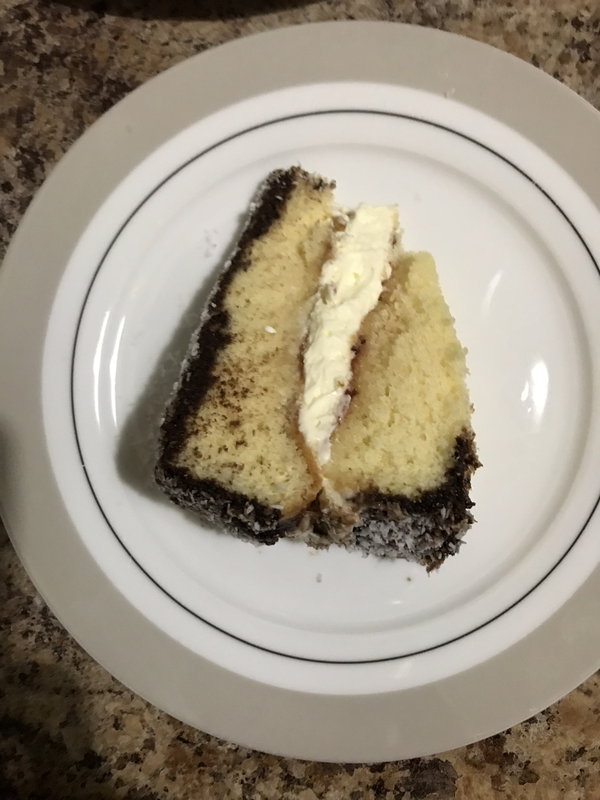 Spread one sponge with jam, then cream to within 1cm of edge of sponge. Top with remaining sponge. Whisk the chocolate and water in a medium bowl over a saucepan of simmering water until melted and smooth. 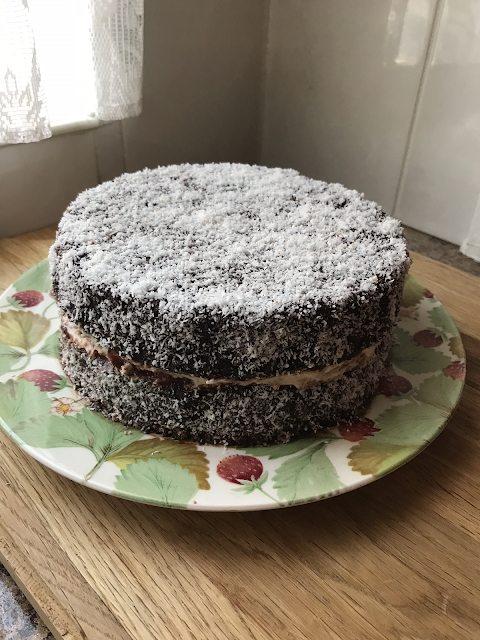 Remove from heat; gradually whisk in icing sugar and cocoa until smooth. The mixture is runny so use a spoon to cover top and sides. Sprinkle the top and sides with coconut; refrigerate until set before cutting. Note: I had half the chocolate mixture left over. Better to be safe than sorry you don't want to have not enough. Always better to have a little more than you need.